I trained a lot this winter break because I want to play better throughout the year. I didn’t quite play well last year which I think it has to do with strength and endurance barrier. Moreover, both of my knees were in pain toward the end of the season due to lack of stretching and training plus carrying extra weigh on my body. 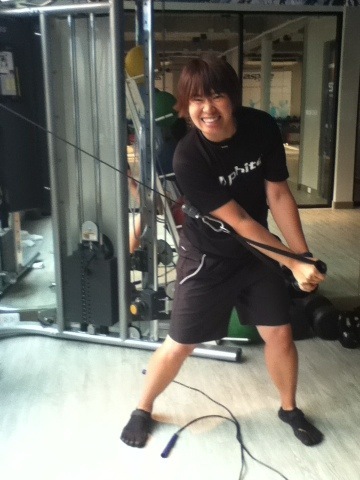 Therefore, I decided to lose some weigh and train hard to prepare myself for 2012 season. I lost almost 10 Kg. since I started training and diet properly. I only ate protein and complex carbohydrate on the first 30days. This means that I could eat meat, vagetable, some daily product and some fruit. I tried to cut all high sugar stuff out of my system. I trained a lot with my trainer in Bangkok. His name is Daniel Remon, he has helped me out a lot with my training program. I trained at least three day a week. I did bootcamp either before 1-hour golf specific training with Dan or after golf training. I sweated a lot during the session and I felt so great about my health and condition. Thanks dan for that.